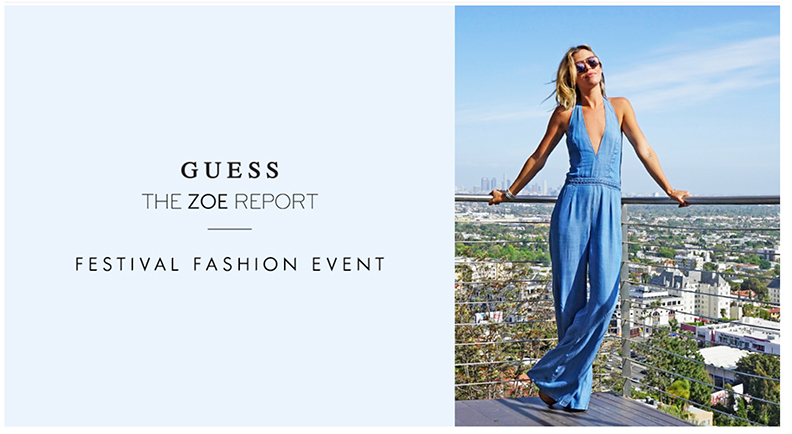 I am very excited to invite you tomorrow to the Festival Fashion Event I am hosting for Guess Lincoln Rd. Miami. As we all know festival season is coming up and Guess has some key pieces to add to these fun spirited looks. I had the chance to put together a few outfits from the new collection and the results nonetheless are very appropriate for this upcoming season of events. Picking out these outfits got me feeling the vibes of what spring and summer brings and how exciting and fun these seasons are… by far my favorite ones. For this look I wanted to channel a rockabilly style, fitted jean jacket, high waisted short shorts, headscarf and leopard print flats, give this greaser look a bit of a girly touch. It’s so much fun to dress up for festival season and enjoy all the outdoor activities looking fierce. Come join me and pick your festival looks at tomorrow’s event, there will be a braid bar and DIY flower crowns, a great addition to tie in your festival goddess looks together. Don’t forget to RSVP and get ready for a great late afternoon party. The address is 546 Lincoln Road, Miami, Fl. 305 695 8883, I hope to see your lovely faces there! Estoy muy feliz de poder invitarlos y compartir con ustedes esta invitacion al “Festival Fashion Event” de Guess, Lincoln Rd, Miami. Como saben ya se avecina la temporada de festivales y Guess tiene piezas claves para estos looks de espíritu divertido. Tuve la oportunidad de escoger unos looks de la colección nueva, muy apropiados para estas fiestas. Escogiendo estos looks, comence a sentir esas vibras y energia que la primavera y el verano traen y lo mucho que disfruto y me gustan estas temporadas. Para este look canalice un estilo rockabilly, chaqueta de jean ajustada, shorts cortos de tiro alto, pañoleta y zapatos con estampado de leopardo, le dan a este look varonil un toque femenino. Me parece divertidisimo vestirse para temporada de festivales y disfrutar de todos los eventos viéndose y sintiéndose como una diosa. Acompáñenme para una tarde de looks inspirados por esta temporada de eventos festivos, tambien habra un ‘Braid Bar” y un DIY de coronas florales, perfecto para complementar todos sus “picks”. 546 Lincoln Road, Miami Fl 305 695 8883, espero verlos! A propósito…. el carro estaba cerca de mi oficina. El cual paso a diario desde hace meses y fue el prop perfecto para mi look!